This is a great Sunday meal in my home. All the work is in the beginning. 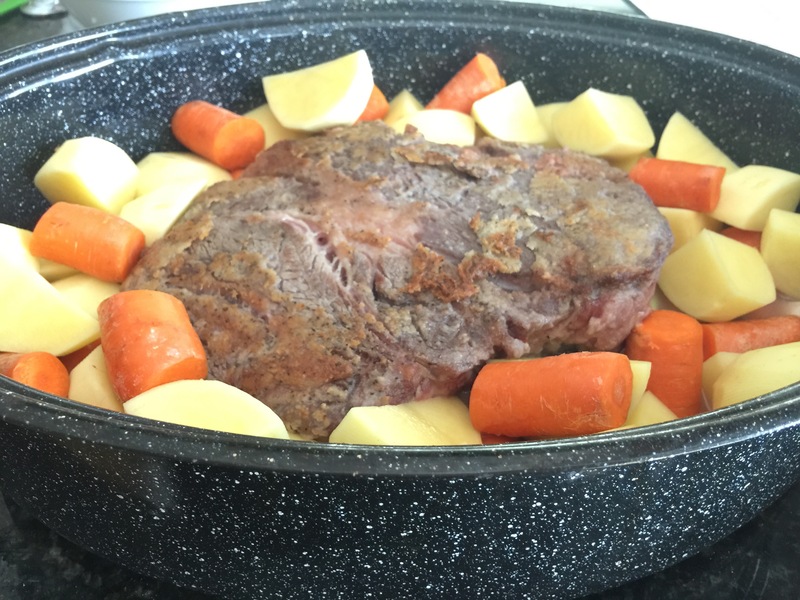 Once the roast goes into the oven you can just set a timer and relax as the wonderful aroma wafts through your home. This is especially nice for when you are expecting guests. They will be drooling as soon as their feet cross your threshold. 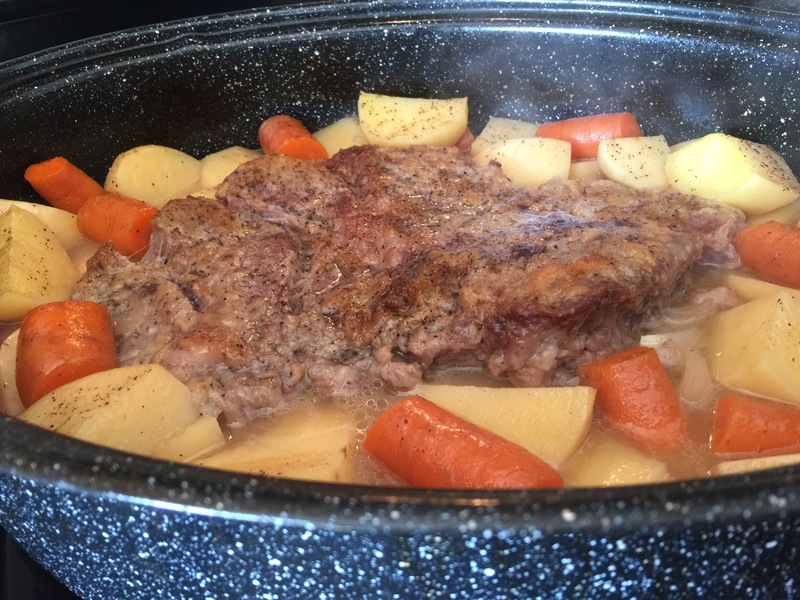 The wine provides a very special flavor to the dish, but my Muslim and Bible Belt friends (and any others who prefer not to cook with wine) can simply substitute beef stock or apple juice for the wine. Cutting board, vegetable peeler, knife, fork, wine bottle opener, large skillet, large covered roasting dish (or a large baking dish and aluminum foil). 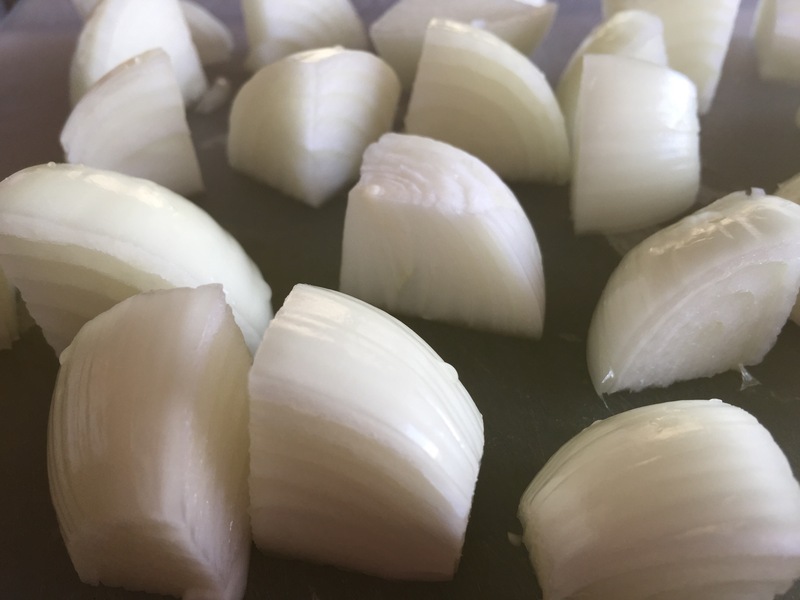 Peel and rinse the onions and cut them into quarters (or eighths if they are large onions). 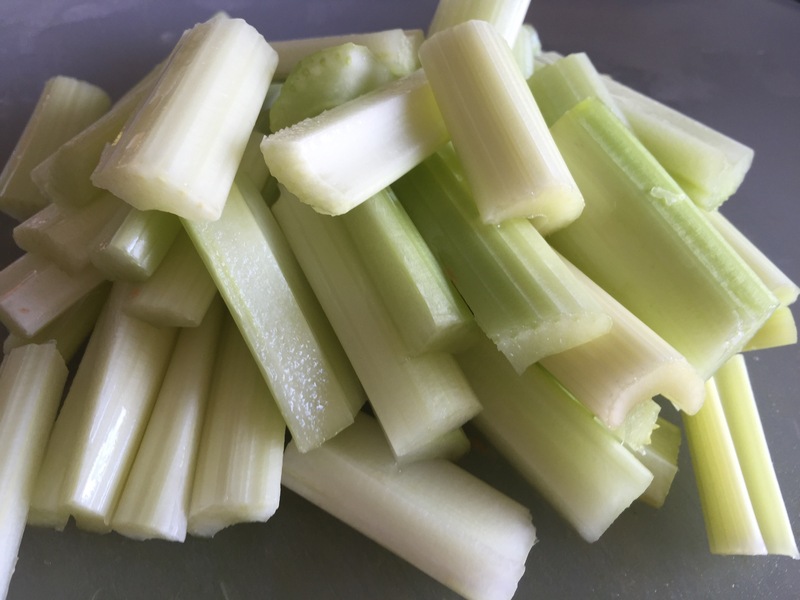 Thoroughly wash the celery stalks and cut them into approximately two-inch chunks. 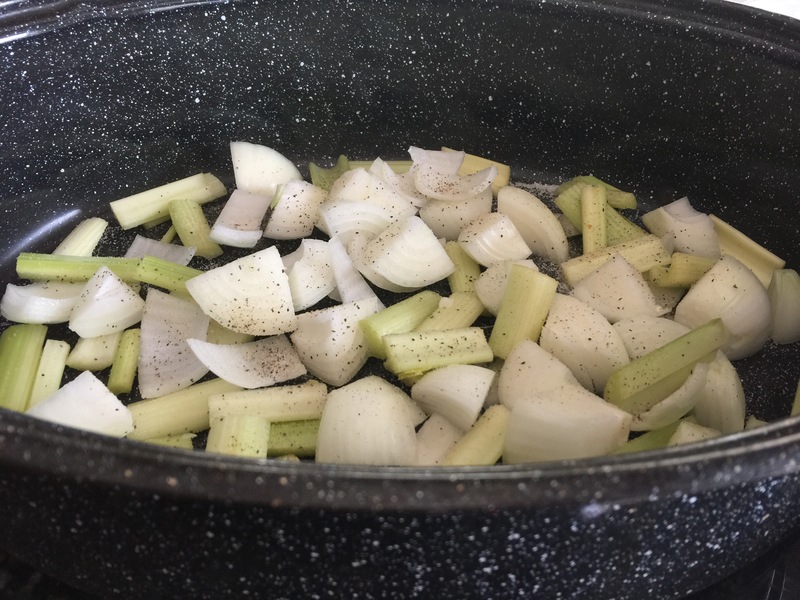 Place the pieces of onions and celery in the bottom of the roasting pan. This creates a tasty bed for your roast to lay on. Sprinkle some of the garlic salt and pepper over the onions and celery. A key to good cooking is seasoning as you go. 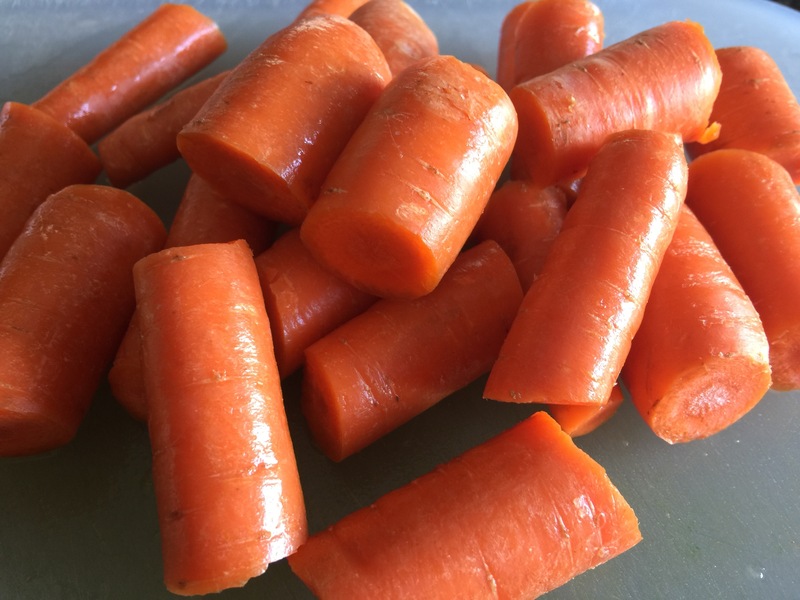 Thoroughly wash the carrots and cut them into approximately two-inch chunks. 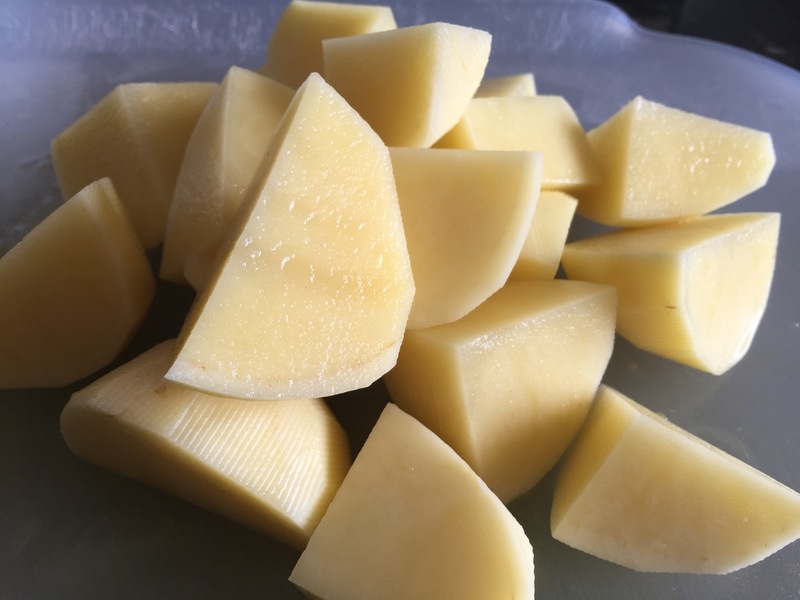 Peel and rinse the potatoes and cut them into quarters (or eighths if they are large). Using a fork, poke several holes all over both sides of the roast (this step has always made my roasts more tender). 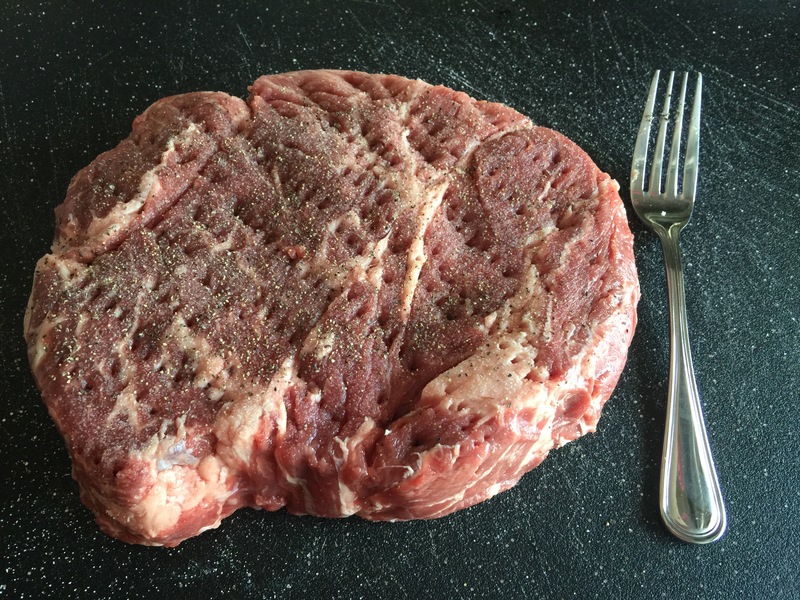 Generously sprinkle garlic salt and pepper on all sides of the roast. 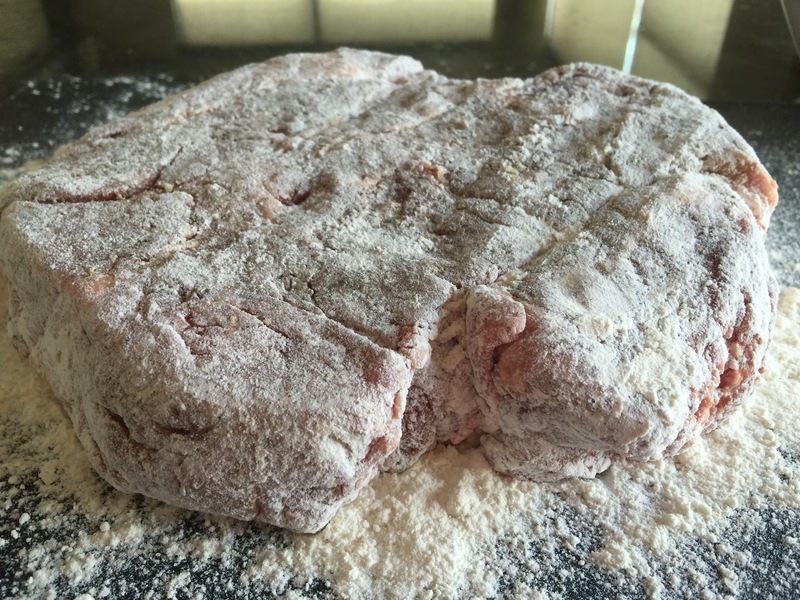 Generously sprinkle flour on all sides of your roast. 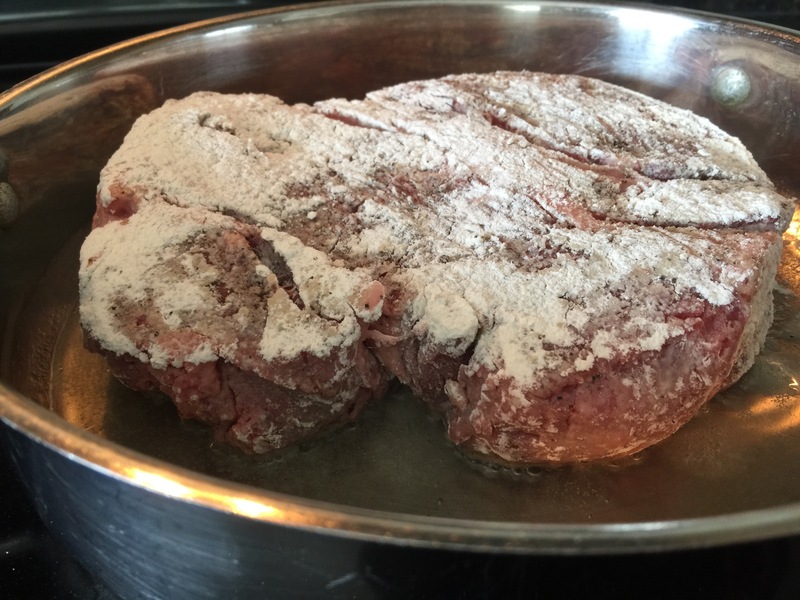 This will help to brown the beef and will slightly thicken your pan sauce while the beef cooks. Feel free to skip this step if you prefer to avoid gluten. Heat oil in the skillet over medium high heat (make sure there is enough oil to cover the bottom of the skillet; add more or less depending on the size of your skillet). 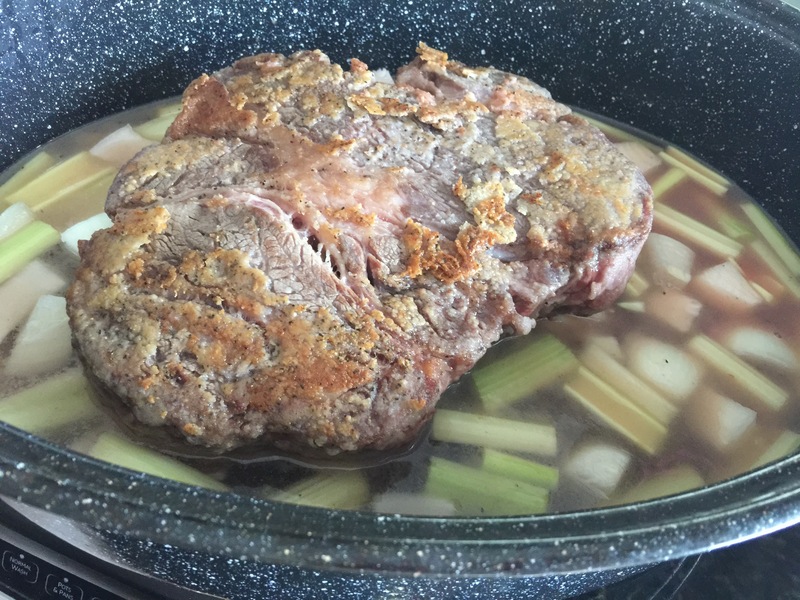 Once the oil is hot, place the roast beef in the skillet and brown the roast for approximately five minutes, or until the bottom is slightly browned. Then flip the meat and repeat on the other side. 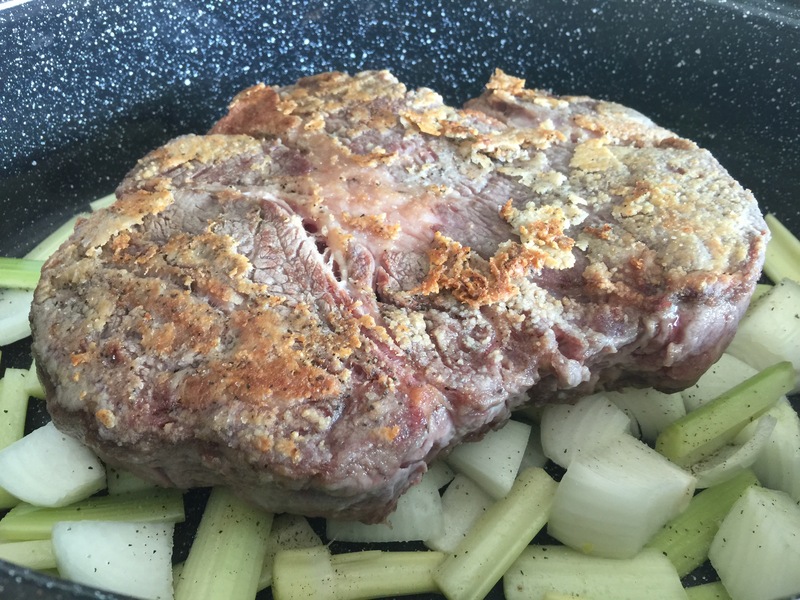 Place the browned roast on the bed of onions and celery in the roasting pan. Don’t worry if some of the flour sticks to the skillet. Those bits of goodness will be an integral part of the next step. 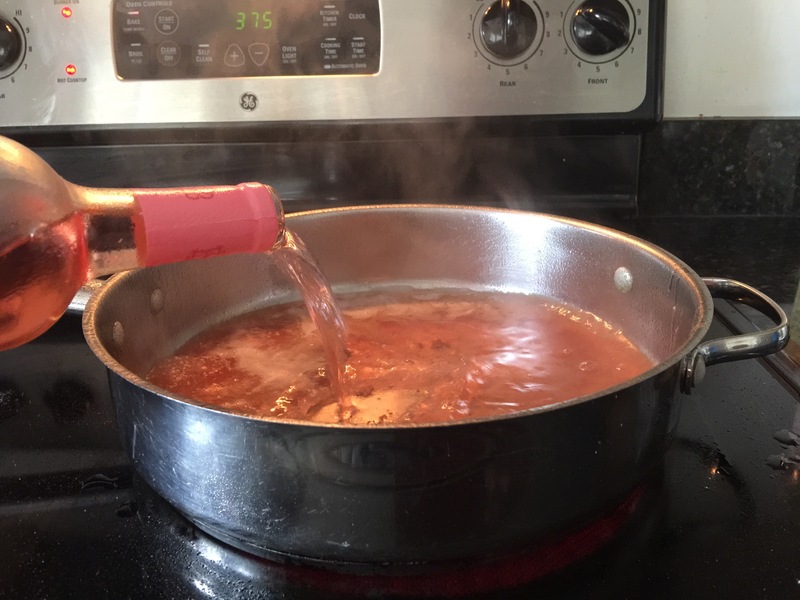 Open the bottle of wine and pour the whole bottle into the skillet. Scrape up any bits of flour remaining in the pan. Sprinkle some of the garlic salt and pepper into the wine and reduce the wine to about half (cook for about 7 minutes). 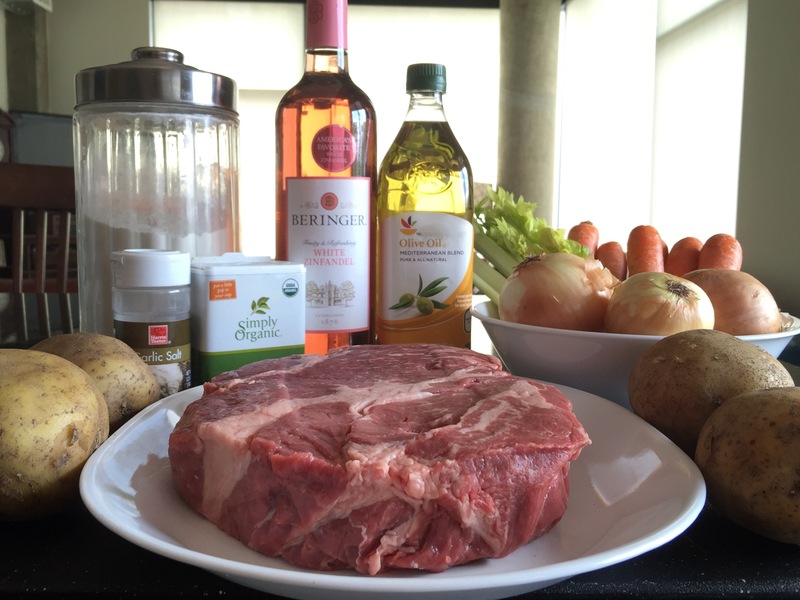 Feel free to use beef stock or apple juice instead, if you prefer not to cook with wine. Pour the reduced wine into the roasting pan on all sides of the roast. Add a little water to the skillet (enough to cover the bottom of the skillet) and add that around (not on) the roast. 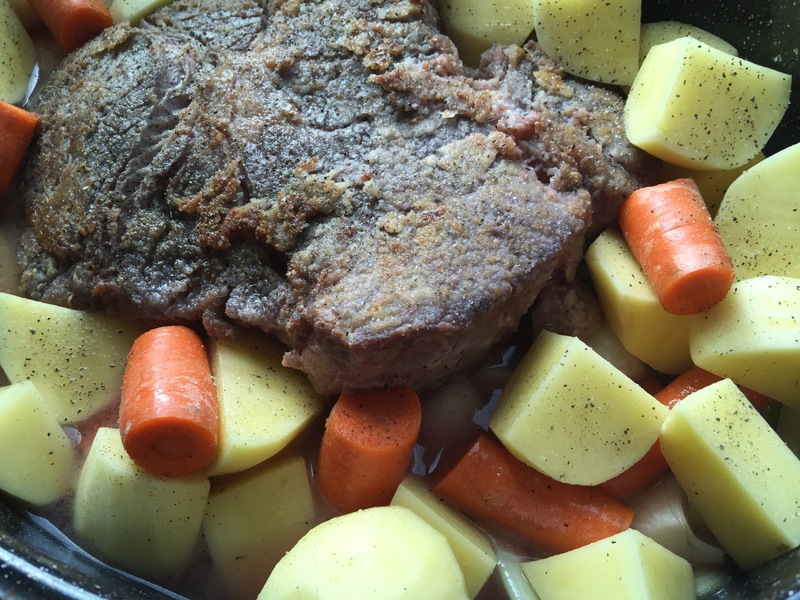 Place the pieces of potatoes and carrots around the roast. Sprinkle more garlic salt and pepper on top of the roast, potatoes and carrots. Cover the roasting pan and place it into the oven. Set the timer for 75 minutes. Kick back and relax as the oven does its job. Enjoy the aroma as it wafts through the air and enjoy watching your family and friends grow ever more anxious to eat that delicious smelling food! When the timer is up and you just can’t stand it anymore remove the pan and take the temperature of the meat. My family likes their roast medium well. The temperature registered 190 degrees this time, which is higher than it needs to be, but it turned out perfect for us. You could also simply cut off a very small piece to check for desired doneness. Also, poke a potato and a carrot with a fork to ensure they are soft. 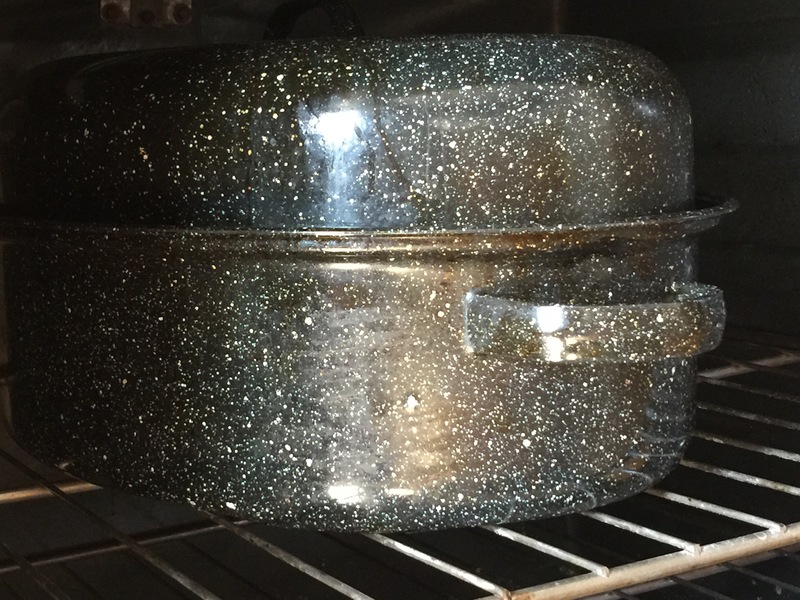 If you need more doneness, cover the roasting pan and place it back into the oven and check back in a few minutes until it is perfect for you and yours. The key is keeping it tightly covered to avoid the liquid drying up. 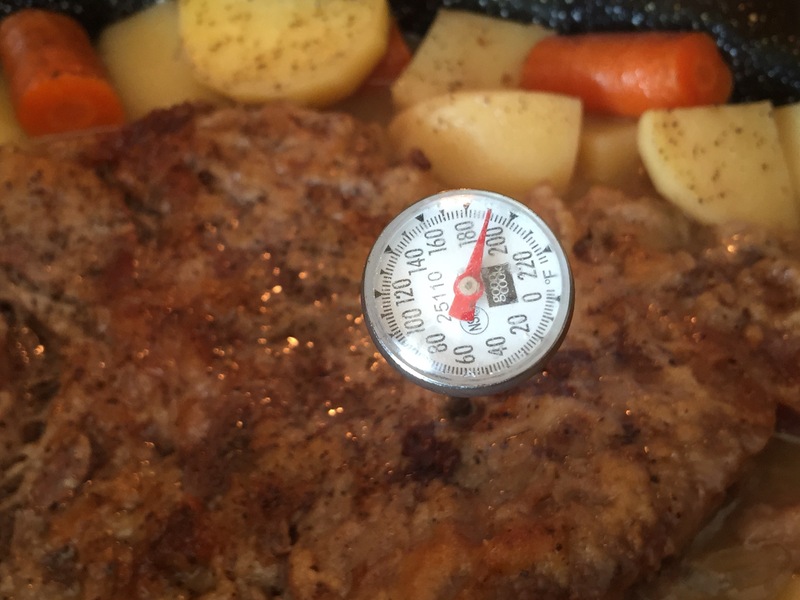 Once the roast and vegetables are at your desired level of doneness, allow the roast to rest for about 10 minutes to allow the juices to settle down inside. Then remove the roast and carve it into small pieces and place the carved beef back into the pan and cover with the pan juices. I like to place the whole pan on a towel in the middle of the table and serve it family style. 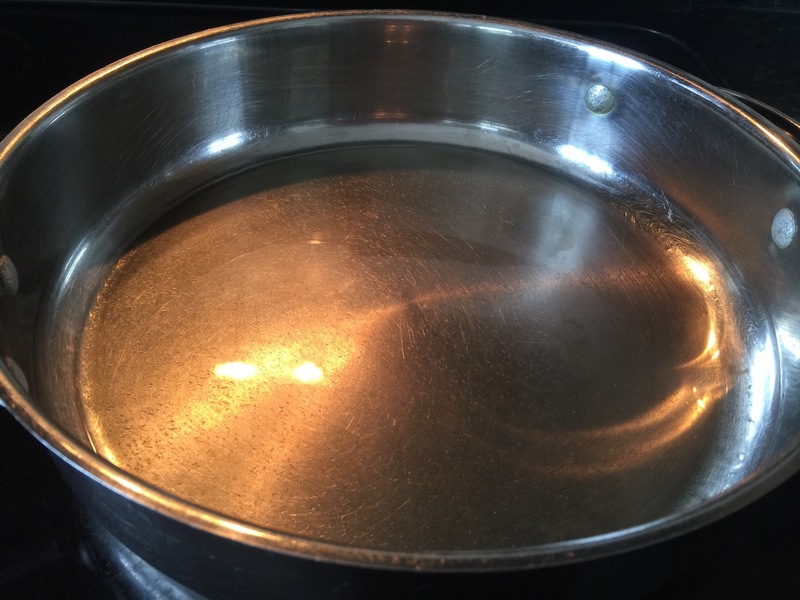 If you keep the lid on until your loved ones gather around the table, it can make a great impression when you lift the lid and see all that wonderful steam emerge. There is nothing better that a delicious and hot home cooked meal. I hope your loved ones enjoy it as much as mine do! OMG!!!!!!!! This looks wonderful….. I am so totally going to make my roast this way. I cant wait to try it!!!! Great! Let me know how it turns out Trelynn.